Andy joined the Queen’s Royal Lancers in 2002 at the age of 16. He undertook his training at the Army Foundation College, Harrogate. After serving in Iraq, aged 18, in 2010 he deployed to Afghanistan on Op HERRICK 12. He was a Corporal and Second in Command of a section and whilst on his penultimate patrol of the tour, he was searching a compound when his unit came under sustained and heavy fire. As second in command of his section, Andy raced to join the rest of his troop on the roof of the compound but no sooner had he reached them then a rocket propelled grenade took off his right arm. A close friend was killed in the same incident. Andy recalls ‘lying on the floor in a lot of pain with my hand on fire. My arm was away from my shoulder just lying there. I was still wearing my glasses and could see my friend’s body beside us. And I thought ‘ouch that hurt, I think I’ve been hit’. Andy is only alive today because his team radioed for a helicopter and within 10 minutes were carrying him to it across an open field despite continuous, enemy fire. The day after being evacuated to Camp Bastion he was in a stable position and was flown to a hospital in Birmingham for further treatment. Nearly seven years on it has been a long road to recovery for Andy. He has become one of only a few people in the world to be fitted with a bionic arm powered by the brain. He told us ‘When I found out I was getting the arm I thought this is a bit too much in the future this, to have a prosthetic arm that works off your thoughts, are these doctors on the same planet as me?! But I was over the moon because it’s the best thing in the field of prosthetics so it’s quite a privilege and an honour to get the surgery’. 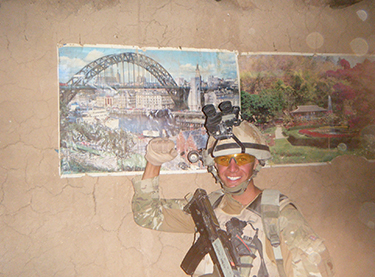 ABF The Soldiers’ Charity gave Andy two grants to assist with his rehabilitation. The first paid for an iPad. This was deemed an essential piece of equipment for Andy; he was desperate to remain independent following his medical discharge from the Army in 2013, and top of his list was finding a new job, but due to the nerve damage in his remaining hand he found it extremely difficult to hold a pen. Due to its lightness, an iPad allows Andy to type with just one hand. The second grant was for adaptations to his bathroom. Prior to this Andy had fallen out of his shower a number of times so adaptations were urgently needed before a more serious accident occurred. Our funding helped provide a wet room thus ensuring Andy could safely carry out his daily routines. Andy is married to Kailey and they have one son. Thanks to the bionic arm he is now able to ride his motorcycle and drive a car again. He says that ‘Having The Soldiers’ Charity behind me, it’s not only given me more independence, it gives me reassurance, just knowing that people are out there, to give support if needed. I think it’s really important that people know about the work of the Charity because they are a cushion for our soldiers and veterans who may not have any stability and need help. The charity relieves so much stress; they are simply there to help those in need. The iPad, the wet room were both just a phone call away’. Andy is now employed working at a property management company in Newcastle, letting and developing property. By donating to The Soldiers’ Charity, you could help another returning soldier like Andy get on with life without having to let injury or hardship hold them back. Be the first to hear about our latest news and events, and our ongoing work with soldiers and veterans.